Grissini are very thin, crisp bread sticks that originated in the Piedmont region of Italy. 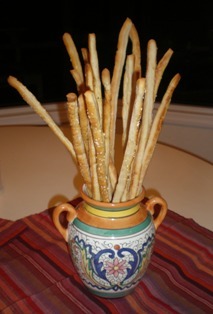 Grissini can be served as an appetizer or as part of an antipasto platter. vermouth capital. Torino is also the birthplace of torrone, almond nougat, and is also known for its chocolate confections. 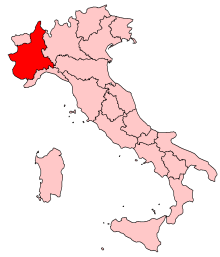 products of the Piedmont region. Most prized of all the local products are the white truffles. Piedmontese cooks shave paper thin slices of raw truffle over steaming risotto or homemade tajarin pasta. A distinctive characteristic of this cuisine is the use of butter. The classic butter and sage sauce shows the Piedmontese love of butter. This region is famous for 'bagna cauda', a garlic and anchovy dip for raw vegetables. Grissini, the slim breadsticks that are found on many Italian tables, have their origins in Piedmont. Handmade grissini are very crispy and thin, and can be up to one meter long. The forests produce great wild mushrooms, which along with cardoons, are gathered and used in many dishes. The 'slow food' movement, the Old World's answer to the fast food revolution, was founded in Piedmont in 1986. 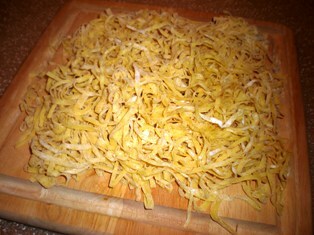 Tajarin pasta is served simply, usually with butter and freshly grated Parmesan cheese. During the truffle festival, tajarin is always served with shavings of white truffles over a rich sauce. Since fresh white truffles are expensive and not readily available, use packaged truffle butter, truffle oil, or preserved truffles. Go easy on the truffle oil as a little goes a long way. The flavor may not be exactly the same but it is good none the less. Tajarin is the egg-yolk-rich pasta from the Piedmont region of Italy. Their golden color comes from the farmhouse egg yolks, which are almost orange in color, and their delicacy comes from being cut into strands from 1/8 to 1/4-inch wide. One of the original recipes called for using 30 egg yolks to a little over 2 pounds of flour. Unless you have access to farm-fresh eggs, your pasta will not have the rich, golden color of traditional tajarin. But this recipe does make a rich, egg pasta with a silky, smooth texture. While tajarin is the Piemontese word for these noodles, they are also often referred to as tagliatelle. Put the flour in the bowl of a food processor. In a small bowl, combine the yolks, oil, and water. Add the yolk mixture to the flour. Process for about 30 seconds or until the dough gathers into a ball. If it does not come together, add more flour or water as necessary. Shape the dough into a disk, wrap in plastic wrap, and let rest at room temperature for 30 minutes. Cut the dough into 4 equal pieces. Keeping the dough lightly floured, roll each piece through a pasta machine. As the dough gets thinner and longer, cut the strips for easier handling. Cut the strips into 7-inch lengths. Flour the strips of pasta, and roll them up loosely, like a jellyroll. With a sharp knife, cut through the rolls at 1/8 to 1/4-inch intervals. Shake and unroll the cut ribbons. Dust them with flour and place them on a floured surface. Cook the pasta in boiling salted water for 1 to 2 minutes. Meanwhile, melt the butter in a large skillet and add 1/4 cup of the hot pasta water. Transfer the cooked pasta to the skillet. Toss the pasta until well coated with the butter. Add half the grated cheese and shave half the truffle over top. Gently toss to blend. Serve in individual bowls. The two most commonly found are black and white truffles. White truffles come from Alba, a town in the heart of the Piedmont region, and are called tartufo bianco. These truffles are most aromatic between September and December. One thing that is important to remember when eating a truffle,is that it is always best to eat it with simple foods like scrambled eggs, pasta, and rice dishes. Truffles are also added to cheese, especially the mountain cheeses of Piedmont, such as in Toma cheese, as well as in salami. White truffles, especially the winter variety should never be cooked. White truffles release a strong scent when they are shaved very thin and served over warm dishes. Fresh truffles should always be used the same day, or within 3 days of purchase. Black truffles are best if used when cooking a dish, as their aroma and flavor are longer-lasting, and will seep into your preparation. To use a black truffle, melt about 4 tablespoons of butter and add a shaved truffle; cook over very low heat for just a few minutes and then pour over freshly cooked pasta. Preserved truffles are also available and have a long shelf life. You won’t get the same flavor from preserved truffles but they do add their own unique flavor to a dish. You can enhance the flavor of preserved truffles with truffle oil or truffle butter, to truly bring back the fresh truffle flavor. Mushroom ragu may be served over pasta, polenta, or gnocchi. Melt the 3 tablespoons of butter in a large skillet over medium heat. Add the onions and garlic. Saute the onions until translucent, about 5 minutes. Add the mushrooms and thyme. Saute until the mushrooms are golden brown, about 5 to 6 minutes. Season with salt and pepper. Add the Marsala wine, scraping up any browned bits on the bottom of the skillet. Add the vegetable broth and tomato paste; bring the mixture to a boil. Reduce the heat to low, cover, and simmer for 20 minutes. Stir in the remaining 1 tablespoon of butter. Remove from the heat. Stir in the parsley and Parmesan cheese; check for seasoning. Porcini Mushrooms are as great a treasure to the Piedmont as the truffle. Porcini are characterized by a big, round, fleshy cap that is supported by a short round stalk. The name porcini means "piglets" in Italian. The porcini has a meat-like texture with an earthy and somewhat nutty flavor. Porcini grow in association with specific trees. Many mushroom foragers find porcini living under pine trees but it is claimed that the best porcini are picked in chestnut woods. 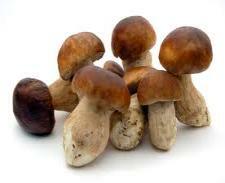 This mushroom reportedly has a high protein content, which makes them a great meat substitute in vegetarian dishes. Fresh porcini are more common for sale in Europe than in the United States. Dried porcini mushrooms are still very good and add a strong flavor to pasta, soups, and sauces. Dried porcini are usually sold in clear plastic or cellophane packages. Look for large whole slices with a minimum of crumbs and debris in the bottom of the package. Soak the dried procini mushrooms in enough boiling water to cover for 15 - 20 minutes. If your recipe calls for water or other liquids use the mushroom water after draining; this adds an even stronger flavor. After draining, chop them and add to a recipe as you would any fresh mushroom. Fontina is an Italian cow's milk cheese. 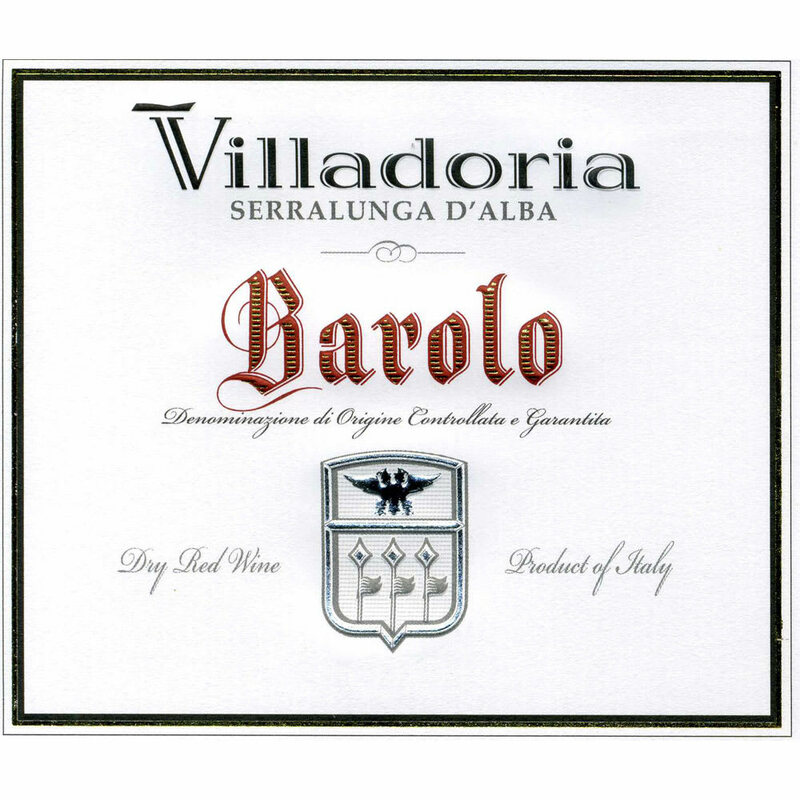 It is produced throughout Italy but the original version is from the Aosta Valley in the Alps, which is just north of the Piedmont region. Serve this sauce over potato gnocchi or over vegetables such as broccoli, cauliflower, or asparagus. In a small saucepan, whick together the egg yolks and cream; add the cheese. Cook over medium heat, stirring until the cheese melts and the sauce is smooth. Gnocchi are made throughout Italy but the stuffed version is made mainly in the Piedmont region.The gnocchi are made from a potato dough that encloses a filling of meat, cheese, or vegetables. 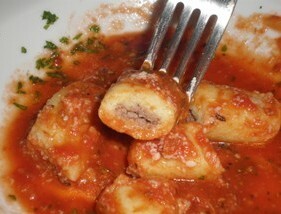 The manner in which the gnocchi are formed varies; they can resemble small ravioli or dumplings. Another gnocchi dish made in the Piedmont is a gnocchi gratin. Potato gnocchi are topped with Fontina cheese sauce and breadcrumbs and baked until golden brown and bubbly. Agnolotti are stuffed, fresh pasta squares similar to ravioli in which the filling is placed between 2 layers of dough and cut all around, agnolotti are simply folded over. Agnolotti can be gently poached, pan-fried in butter, added to broth to make soup, or served with a sauce. Typically, agnolotti are served in a beef broth with a little melted butter or in a fresh sage and melted butter sauce. The Piedmontese also like to serve agnolotti with white truffle shaved over them.